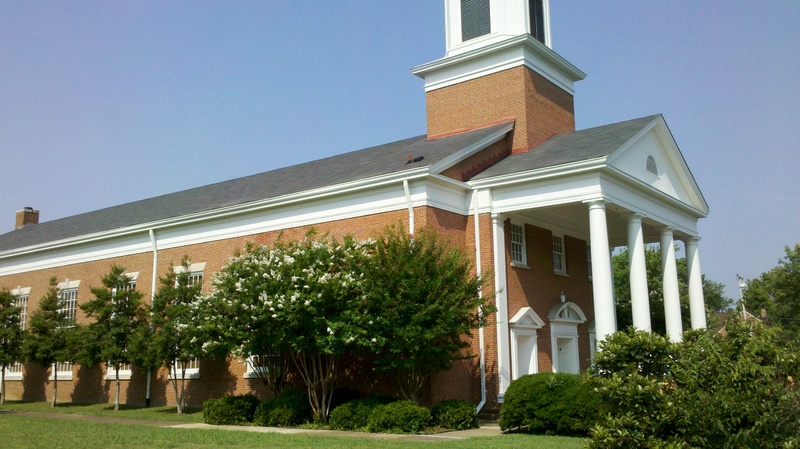 New City Fellowship is a traditional red brick church building that sits on East 3rd Street near Missionary Ridge. From the outside it looks very typical…almost boring (not being critical, just setting up the rest of the article). It is not until you enter the building that you begin to see things you would not expect. After entering through the big white front doors, we worked our way through the small lobby and a series of smiles and polite greetings, into the large open sanctuary. The room was filled with old-style wooden church pews leading up to the pulpit, which had various instruments inserted into any available space, as the area was clearly built for a much different selection of musical equipment. The main component of the pulpit area was a piano/keyboard combo with choir seating that rose behind it, yet remained empty throughout the service, further accentuating changes in the style of worship from when this building was originally constructed. 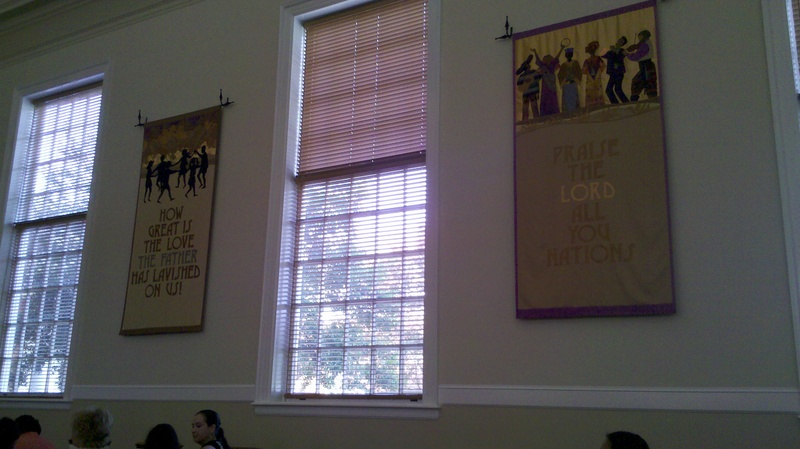 The walls were adorned with large banners with sayings such as “Praise the Lord All You Nations” sewn onto them in brown, tan, and black letters. 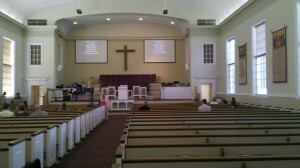 We found seats near the front of the room and greeted people as they filled in the pews around us. We engaged in casual conversation with a few people in the row behind us, while also being entertained by a small girl in the row in front of us who was popping up and down playing peek-a-boo. A man came up to the podium and began with church announcements, competing with the low roar of conversations from the congregation, which slowly tapered out as he continued. The worship band had taken their places during this time and began playing music as the announcements ended. The music that ensued was joyful and spirited, with singing, clapping, dancing, and hands raising to the jazzy gospel-influenced praise and worship songs. I smiled and sang as I watched a tambourine lady happily groove and shake her way up and down the center aisle, creating a cheerful atmosphere of praise to the Lord. James Ward, the music leader at New City Fellowship, is an accomplished musician and songwriter, and I would argue that the praise band at New City is probably the most talented in Chattanooga. The music was as eclectic as the congregation, which consisted of the most diverse mixture of race, age, and (apparent) income level that I have seen in a church so far. We sang four songs with a prayer sandwiched in between, followed by announcements in Spanish and then the collection of tithes and offerings. At one point during this segment the visitors were asked to stand, and then during a designated greeting time the church members were directed to “especially make our visitors feel welcome”. The beginning of the service closed with the performance of a song that the children had learned during vacation bible school the previous week, complete with the funny face making, lyric forgetting, and attention wandering that always make you smile from ear to ear…one of those wonderful moments that is a blessing to everyone in the church. The sermon for this service was given by a Pastoral Intern, Ronnie Perry, who began with Scripture from Isaiah 6. He spoke about what he called a corruption in Christianity today in which people attempt to use God as a tool to meet their own goals and desires. He delved into the deeper subject matter of how many self-willed Christians continue to focus on the short-term in this life rather that on eternity or the big picture, which causes us to blend in with everyone else rather than stand out as Jesus did…a point which he emphasized by saying “Christians today want the things of the world just as bad as the people of the world.” Pastor Perry continued by breaking down the Isaiah passage into three segments which he called a God encounter, a self encounter, and a response. He reasoned that we must first see God as a reality rather than a concept, after which we will become shaken and self-aware that there is nothing impressive about us without the God who created us. The response we should then have is to stop trying to shape God around ourselves while only believing what is convenient for us to believe, and instead follow God and live for Him as He calls us to. During the sermon, Laura and I looked at each other in one of those “a-ha” moments because this message was exactly what we had talked about on the way to church. I am talking about the same message, not a similar message. It was a “God” moment in which you get chill bumps because you realize how the Holy Spirit speaks to you and prepares you for certain situations and experiences. Wow! God is awesome! After the service, which had ended with an altar call, we ventured back to the visitor’s reception area that had been mentioned during the service as an opportunity to learn more about the church over a cup of coffee. Of course, anytime there is coffee involved you can count me in, so we filled a cup and began sipping and struck up a conversation with two ladies, Estar and Sarah, who were attending the coffee station. Estar gave us some excellent insight into the various ministries and service that New City provides to the community, which mainly focus on serving the poor and supporting foreign missions. In fact, Estar came to the U.S. from Kenya as a result of the mission work of New City. She spoke with conviction about the church and how she liked that they hold members accountable for serving in some capacity. After about thirty minutes of great discussion, we parted ways and headed home. Laura and I felt like we had experienced a truly unique church that celebrates and embraces all the cultures that make up the extremely diverse congregation. In this church there was no sense of a forced integration or any sort of reluctance to come together. It was as if the color and culture barriers had been overcome in this church effortlessly, which tells me that the Spirit is present and the love of Christ consumes the people of New City Fellowship. If you know someone who has stopped going to church because of a bad experience where they felt out of place, unloved, or not accepted, I would encourage you to bring them to New City Fellowship. It will not only be a blessing to them, but also an example and a great experience for you as well. Even though it may look boring on the outside, I promise the experience inside will be anything but. I’m excited to hear that you’ve been given some additional direction by God through the newspaper article about ChurchSurfer! It’s always amazing when things keep pointing you in a certain direction…I’ve experienced that as well. New City Fellowship was a great visit for me and my wife, and it sounded like there were a lot of opportunities to serve and get plugged in there. I’ll be praying that you are able to connect quickly with people who will be a blessing in your life and with opportunities to serve and be a blessing to others as well! Peace & blessings in Christ! I am glad that you and your wife have not settled. I would like to extend an invitation to you and your wife. Come Visit the Chattanooga Church of Christ. We meet at the Battle Academy (school) on the corner of Market and Main in Downtown Chattanooga. Susi, we’ve committed to “surf” for all of 2011 but will be looking forward to settling into a church home in 2012 (if it is God’s will, of course). Thanks for the invitation! All of my church visits are unannounced in order to experience the church as a true visitor, so I can’t commit but will keep that suggestion in mind. Peace & blessings in Christ! Josh, I had to leave a comment after reading this. I just happened to come across a link on facebook of your experiences trying out so many churches in Chattanooga. Having lived in Chattanooga several years ago and regularly attending New City, I thought it was amazing that the first post I saw was this one. I live in Chicago now, and have for the last 13 years, but still visit New City whenever I can on return visits. Growing up in the mid-west and southeast, and having a dad in ministry that would often travel to other churches to preach, I’ve been to probably hundreds of churches. 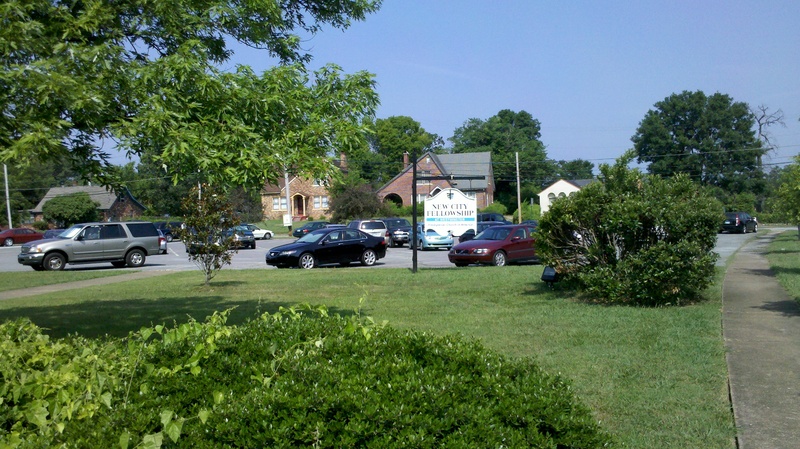 New City is a very unique and special church, not just in Chattanooga, but also the US. Joshua, that was definitely great timing for you to hit the New City blog first. Also great observation that it is not only unique in Chattanooga but around the country as well. I hope all is well in the Windy City! Peace & blessings in Christ! Grace mercy and peace to y’all from God our Father and our Lord and Savior Jesus Christ, personally delivered by the Holy Ghost. Thanks for the compliment and blessings Andrew. I checked out your site and can appreciate your note-taking on your church travels…might come in handy. Hopefully you have a church home or at least a consistent church family. This is a great experience, but not one I want to continue forever. I’ll be looking forward to settling down into a church home in 2012! Peace & blessings in Christ!